A Miami-based real estate firm, Condo Hotel Center specializes in selling luxury condo hotels (condos located in upscale hotel chains like Hyatt and Starwood) and also traditional condos. 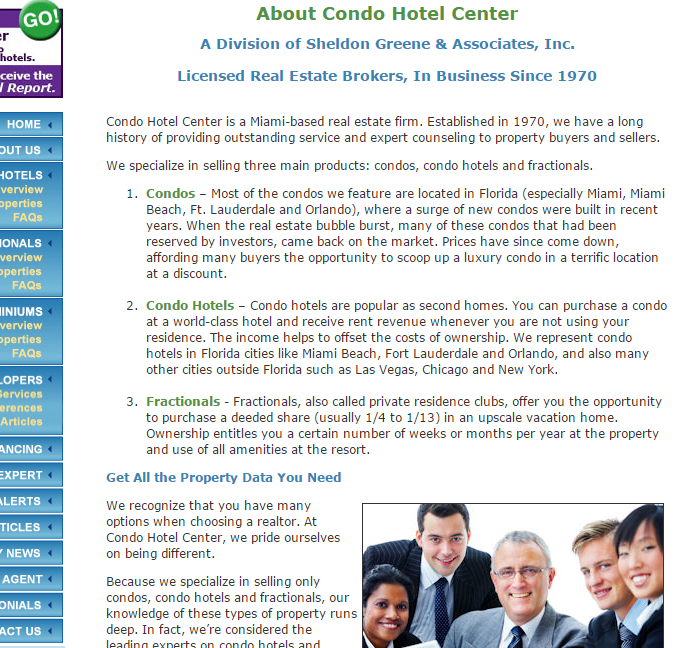 In 2002, Susan Greene, a real estate copywriter, was asked to create a new website that would focus on the condo hotel niche. The site would educate consumers about condo hotels and provide detailed descriptions for any newly developed properties coming on the market. What started as a standard small website of about 10 pages eventually grew into a 600+ page internet giant, every page written by Susan Greene. 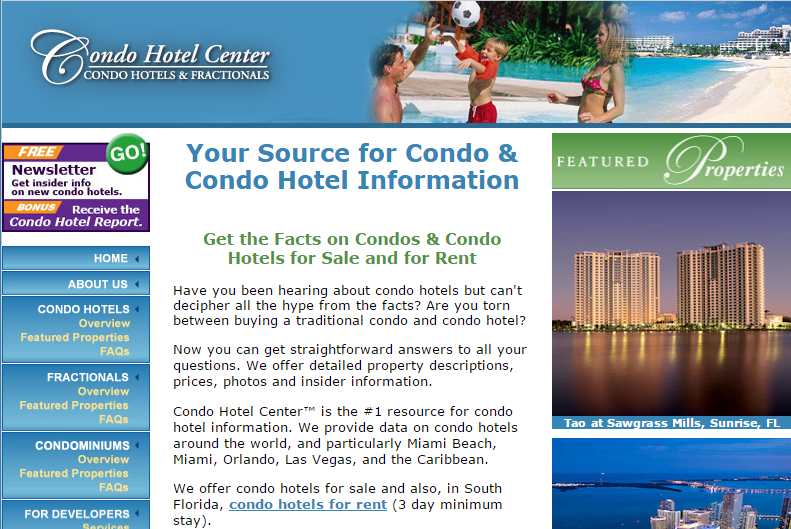 The website soon ranked on page 1, #1 on Google for the keyword phrase “condo hotels” and dozens of related terms. That ranking made the phones ring and turned Condo Hotel Center into the unequivocal leader in condo hotel sales. In recent years, due to changes in the real estate market, fewer condo hotels are being built. Condo Hotel Center has shifted its focus to include sales of traditional condos in the Miami area, where the firm is based. Susan Greene continues to write about available properties on an ongoing basis. Susan wrote web site copy for us that attracts new business daily and ensures our high placement on search engines. We have a real estate business marketed exclusively through the Internet. Susan wrote web site copy for us that attracts new business daily and ensures our high placement on search engines. Do you need a website that delivers prospects to your virtual door? Let’s discuss your company’s website today!